High tech paper cutting machines perfect for all your wide format trimming requirements. The ROWE 198 paper trimmer is the ultimate paper cutting machine. 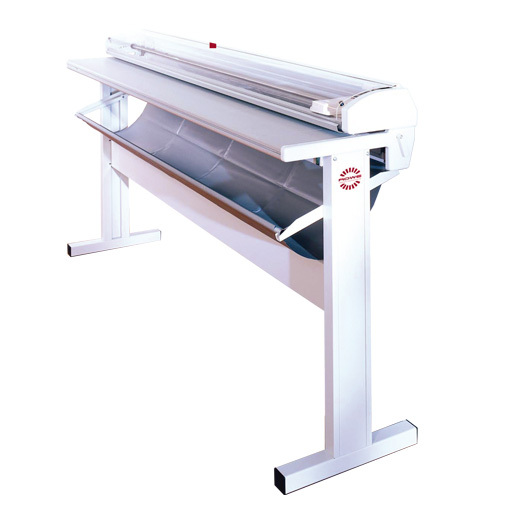 With manual or electrical operation it permits cutting widths of up to 200 cm (79”). For oversize sheets, both sides were left open to allow the material to be pushed through and cut continuously. Aligning marks, according to DIN standards, on the antistatically arranged feed table and the lined pressure rail, enable precise square cuts. With a long life aluminium feed table and self-sharpening, maintenance free cutting head, the ROWE range of paper trimmers will keep you at the sharp end of technology. ROWE would like to introduce you to the fascination of ROWE. Get in touch with our ROWE specialists to arrange a demonstration now!